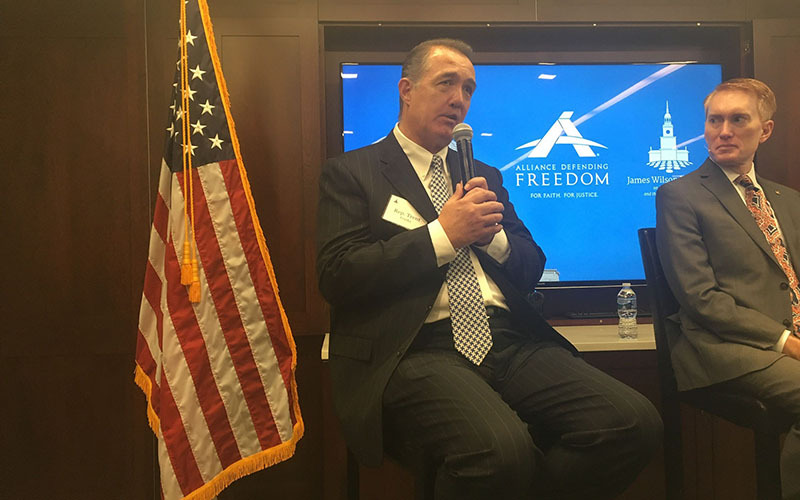 WASHINGTON – Rep. Trent Franks, R-Glendale, said he has high hopes that his twice-defeated Born-Alive Survivors Protections Act will pass this year with President Donald Trump in the White House and Republicans in control of both chambers of Congress. Franks was referring to Trump’s signing Monday of an executive order banning federal funding for international organizations that promote or provide abortions, the first of what is expected to be a week of anti-abortion activity that culminates in Friday’s annual March for Life. As part of those activities, Franks was invited to speak at a forum Tuesday on his bill, which would require any doctor who is present during a failed abortion to admit the “born alive” infant to a hospital for care or face criminal charges. The bill the House in 2015 on a 248-177 vote, but was stalled in the Senate. But a spokeswoman for Planned Parenthood Arizona said there is no need for Franks’ bill, since there are already laws on the books to deal with what she called an extremely rare occurrence. “In 2002, Republican President George Bush signed a born-alive protection act, so it is sort of puzzling why he keeps introducing this legislation,” said Jodi Liggett, the Planned Parenthood official. Liggett added that the occurrence of a “born alive” infant during an abortion is incredibly uncommon since late-term abortions across the country are rare. She said Arizona lawmakers should be more responsive to what their constituents care about. “People care about this economy moving again and that’s what they want their congress people to focus on – not dog-whistle issues,” she said. But those issues have commanded the attention of the House and the White House this week. In addition to Trump’s signing his order regarding what is known as the “Mexico City policy,” the House voted 238-183 to pass HR 7, which would prohibit federal funding of abortions and block use of federal funds for insurance policies under the Affordable Care Act that include abortion coverage. Sen. James Lankford, R-Oklahoma, who has introduced his own anti-abortion legislation and is a supporter of Franks’ bill, joined the Arizona lawmaker on the Tuesday panel. The born-alive bill is one of three Franks has introduced this year. He said all previously won majority votes in the House and he is confident that all would pass if they were put to a vote, a move that Franks believes would have profound implications on Roe v. Wade, the Supreme Court’s 1973 decision recognizing a woman’s right to an abortion. But Vicki Saporta, president and CEO of the National Abortion Federation, said Franks’ born-alive bill is just part of the “Trump-Pence assault on safe, legal abortion care.” She pointed to Saturday’s Women’s March on Washington as proof that Americans want to protect abortion rights.